Blog — I Was Broke. Now I'm Not. You have probably heard something at some point about making contributions into an Individual Retirement Account (IRA) to prepare for retirement. Retirement and investing can seem scary and difficult or only for the super rich but I’m here to tell you: That is a lie. You can (and should!) begin investing for retirement and an IRA is a fantastic way to do just that. The most popular types of IRA’s are the Traditional IRA and the Roth IRA. These investment vehicles are great ways to accumulate retirement money although they differ in their taxation. You can learn more about their differences in our podcast, Roth vs. Traditional IRA. When you decide to invest into an IRA, regardless of the one you choose, you can expect to experience a variety of benefits. Taxation: When you invest into a Traditional IRA, those contributions are made with “pre-tax” dollars which means that you can deduct them from your income. In a Roth IRA, contributions are made with after-tax dollars. This means that while you will not get a tax deduction, you will not have to pay any taxes when you withdraw the money in retirement. The tax benefits of both accounts can provide great traction when accumulating money for retirement. Automation: One of the reasons IRAs are so popular is because they allow you to automate your savings. These accounts are incredibly easy to start and with a simple bank draft, you can make sure that you are investing every single month. Compound Interest: After you have set up your IRA and automate your contributions, you will eventually be able to see the 8th Wonder of the World: Compound Interest. This means that once you start adding money you will start earning interest on that money. And then interest on THAT money. Your money will begin to work for you. These are only a few of the benefits that you’ll experience when investing into an IRA. Ultimately, you want to make sure that you are taking advantage of every benefit that you can when you’re trying to save money for retirement. Whether you are fast approaching retirement or just getting started in life, using one of these accounts can greatly help you accumulate money so you can live your best life when you eventually leave the workforce. In Episode 23 of The Monday Money Tip Podcast, we’re discussing how to choose between a Roth and Traditional IRA/401k when saving for retirement. In addition, I have some updated information in regards to mortgage rates, savings rates and CD rates. We will also hear a success story from a woman who used a 0% credit card transfer and how it changed her debt freedom journey. As people take off on their debt freedom journey, so many times they are tempted to withdraw money from their retirement accounts in an attempt to speed up their debt elimination process. We get questions all the time from people who want to know whether or not we think this is a good idea. I do not think it is ever a good idea to take money out of a retirement account in an effort to pay off debt. Many people feel like retirement is so far away that they have plenty of time to begin saving. And while you may have plenty of time to start saving, you will never regret starting as early as possible. The key is to start investing early and invest consistently. In all likelihood, no matter when you begin saving for retirement, you will wish you had started sooner. When you get started on your debt freedom journey, it can seem like the end is so far away. But I would encourage you to stay the course. Get a budget using one of our FREE tools, calculate your debt freedom date using our FREE calculator and slowly but surely, you will see those debts drop off. And once they are all gone, not only will you be debt free but you will also still have your money working for you in your retirement accounts. Do you feel like retirement is so far away you cannot even imagine it? Or do you feel like retirement is so close that you can taste it? Either way, you should be making your retirement savings a TOP priority today! Statistics show that many people do not start saving until they are only 10 to 15 years away from retirement! If you choose to wait on starting your retirement savings, you are missing out on something that can actually carry your financial burden called compound interest. Compound interest can take your $100/month investment to $1,176,477 in 40 years. The earlier you start and the more consistent you are, the better off you’ll be when you get ready to retire. If you are not actively contributing to accounts dedicated to retirement, I would highly encourage you to start doing so immediately! I have never ever heard someone say “Wow I wish I had waited to start saving for retirement” or “Joe I am retired and I just have too much money”. You will never be able to go back and retroactively start your retirement accounts. But what you can do, is make sure that you do not waste another minute and you start investing today. Throughout the month of October, we have been heavily focused on investing. I wanted to end the month by sharing my current investments. I do not recommend specific investments. I can only tell you the investments I own, and that they have worked well for me. The investments that you choose are up to you. I update this list of investments every March so make sure you are on the lookout. Click below to see a chart of my current investments. In Episode 22 of The Monday Money Tip Podcast, Joe and Megan continue the discussion on the topic of investing. Joe answers the featured question of the week about what types of fees are acceptable on investment accounts and give other important investment information. You will also hear a success story about a couple that paid off $45,000 in credit card debt. They did it and you can too! In our Current Money Events segment, Joe will share how you can make sure that you are prepared for your Christmas spending. Hear how a budget helped a couple pay off $45,000 in credit card debt. Ready to Save TONS OF MONEY? It is a great question. In fact, we’ve offered savings tips in live online events, blog posts, and on our “Next Steps” page on a regular basis. Our help is received with great enthusiasm! As well it should, because who doesn’t like learning ways to save money? Recently, we conducted a 40-day Budget Challenge. It was an amazing journey that people from around the world embarked upon together. It turns out that we share common financial issues when it comes to budgeting! We also learned once again that everyone loves to save money. It caused us to ask the question, “How can we help a lot of people save tons of money?” Our answers to this question led to the creation of our first-ever SAVINGS CHALLENGE! 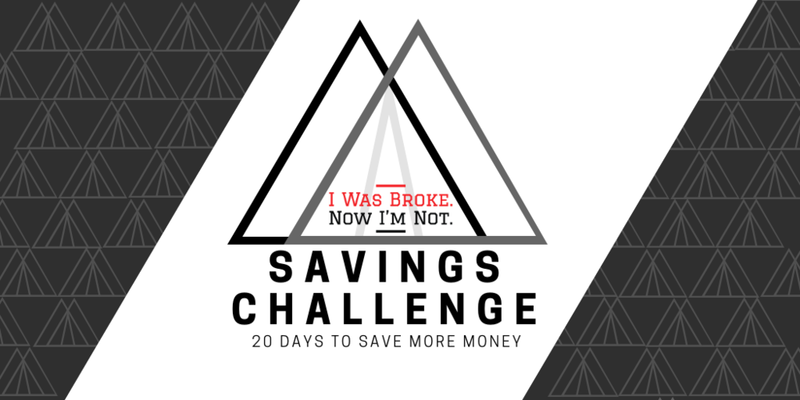 In this 20-day challenge, we’re going to share 20 specific ways (one per week day) most people can save a lot of money in their budget. In fact, many who embark upon this challenge will save a minimum of $1,000 in their annual budget. I told our team I want to enable as many people as possible to be a part of this challenge. As many people as possible. When you CLICK HERE to see the price, I think you’ll agree that it is priced way too cheap. But, hey, this is a savings challenge so I wanted you to start it out with some nice savings. If you’re one of the first people to register, you’ll be able to register at the ridiculously low price. When does it start? It will kick off on Thursday, November 1st and last the entire month! How does it work? You will receive special teaching each weekday of the challenge! These tips will be sent to your inbox first thing in the morning, but you can watch them whenever is convenient for you on our membership site. Can I get real help from the IWBNIN team? Absolutely! Our team is always here to answer any questions you may have. Upon registration, you will receive a special email address that will link you directly to an IWBNIN team member. How much does it cost? This challenge is only $7.00! There was a point in my life where I came to the realization that I needed to find oxen in my life and start getting my money to work for me. From an average bank balance of $4.13, I have since acquired multiple oxen and experienced a truly abundant harvest. In my book, Oxen, I share these principles along with step-by-step instructions so that you too can win with your money. Check out this excerpt from my book and make sure you grab a copy for yourself. Imagine a farmer who was responsible for farming a full section of 640 acres, which is one square mile of land. Imagine if he decided to “do it all on his own” and attempt to plow all the ground without oxen. It doesn’t matter how strong and energetic the farmer is, it would be an impossible task. For me, just hoeing a small garden in my backyard wears me out! The farmer might be able to do enough work to produce food for the family to eat, but the potential for an abundant harvest would be impossible. If I continued managing my money without the help of financial oxen, the opportunity for an abundant harvest would be greatly limited. After all, there was only so much I could accomplish on my own. Like most people, I was working a “Work, get paid. Don’t work, don’t get paid.” job. Even if I worked twelve hours every day, there was a limit to how much I could earn on my own. My earnings would allow me to feed my family, but without a serious change to the way we managed our money, the income would probably only be enough to maintain our household. We would continue to be stuck in the “empty manger” cycle cleaning out the manger each month and then standing around waiting for the next paycheck to arrive. The worst realization of all was knowing that even if I worked the next fifty years of my life, my income would cease the moment I chose to retire. It became imminently clear that I needed oxen in order for my family to experience abundance. Is This Mutual Fund a Good Investment? Many people are hesitant to begin investing because they think that it is some incredibly complicated venture that is only for the uber wealthy. I am here to tell you that it is not that difficult and you can (and should!) get started today at some level. Do I like the product or service they are delivering? Do my children like it? I want to like a product that I am going to invest in first and foremost. If I like a product there is a good chance other people will like it as well. The same holds true for if I dislike a product or service. Is the company profitable? Does the company share those profits with shareholders in the form of dividends? I do not typically invest in companies that are not profitable although there are a lot of people that have made a lot of money off of their stock. When I invest in a company I want to see that they can move an idea towards profitability. What is the P/E? Once I know if a company is profitable, I next look at the P/E or the price to earnings ratio. This is calculated by finding the earnings per share (the total profits of the company divided by the total number of shares) and the current price of the stock. The P/E is calculated by dividing the price by the current earnings per share. I want to see a P/E that is less than 20 and ideally less than 10. Now, do not freak out about having to calculate this number every time you want to invest. You can simply google the company name followed by P/E ratio and easily find out. What is the vision of the company? Do I like the leadership and the direction they are headed? To find this information, I typically utilize several different websites including finance.yahoo.com, money.cnn.com, and schwab.com. As you can see, investing does not have to be super complicated or involve a lot of intense research. When picking mutual funds it can be as simple as checking out their products, leadership and vision and then doing a quick check to make sure they are profitable. If you can put a check mark next to those four boxes, you can probably say that you are making a good investment. This verse had a profound impact on me as I went through my financial freedom journey. From this verse, I realized that I could either live a life with an empty manger or with an abundant harvest and the choice was up to me. In the pursuit of financial abundance, I could choose to rely on myself and my own abilities, or I could acquire oxen to help me. Which do you think I chose? In my book, Oxen, I have outlined the different types of oxen, how to acquire oxen and how to lead oxen. These principles will help you maximize your financial resources and experience an abundant harvest, just as I did, so that you can fund your biggest and wildest dreams. Most people earn money by showing up to work and in turn they get paid. If you do not show up to work, you do not get paid. Oxen can allow you to earn money whether you are working or not! There is only so much time in a day and therefore there is only so much work that one person can physically put in. This is why oxen are so important: they allow you to eliminate the time barrier. Oxen can do things you cannot do. They have the ability to carry a load that you cannot carry and can endure more than you can endure. Oxen can be trained and can work together and accomplish even more. They work rain or shine, night and day so that you do not have to. They can multiply and take you places you may have only dreamed about. Oxen can provide. Do you want to learn more about how you can acquire and maintain oxen? You can get my book Oxen for 20% off plus free shipping by clicking HERE. What is the most important thing to do when it comes to investing? START! Often when you are looking at making an investment, it can seem like a daunting task so taking that first leap is the most essential. Once you have taken that crucial first step, it does not have to be a confusing road to making smart investment decisions. It can be as simple as looking at your life (and investments) in five year increments. The concept of five year buckets is so simple but it is a great way to look at your investments and deciding when to put your money in the market. The principle is this: if you are going to need the money within the next five years, it should not be attached to any investment. This is important because you cannot risk losing the money in the short term because you simply will not have enough time to recover it before you need it. That can put you at the risk of incurring debt when you could have paid for the expense in cash. If you are looking into the future and decide you will not need the money within the next five years, you should definitely tie it to some sort of investment vehicle, that suits your risk tolerance, or else you will face the next obstacle of inflation. Make sure your money is working for you to at least outpace inflation. Investing is as simple as deciding to start and then figuring out when you will need the money. If you need it in the short term, now is not the best time to put it in the market. But if you can put the money away for longer than five years, investing is the way to go. There is always a risk associated with investing and the short term can be particularly volatile but, if you make wise decisions, starting to invest will be a decision you will not regret. Have you ever felt completely overwhelmed by the thought of investing? Are you confused as to where to start? If so, you’re certainly not alone. In Episode 20 of the Monday Money Tip Podcast, we’re here to give you 5 Basic Steps to Investing that you can implement TODAY! In today’s podcast, you’ll be sure to walk away with more than just one money tip! Joe gives some practical ways to start investing. Joe explains the concept of 5 Year Buckets and how it relates to investing. Hear a success story from a couple who is on their way up the I Was Broke. Now I’m Not. Ladder and are beginning their own investments. Joe explains how compound interest doesn’t always have to work against you. It can actually be your new best friend! If you have credit cards and you carry a balance from month to month, this tip could literally save you hundreds, if not thousands, of dollars! You should consider a 0% Balance Transfer Credit Card. With these cards, you can transfer your outstanding balance on your card, to a new card and pay 0% for a specified term. This means that all of your payments will be going directly to principal! This is HUGE! Check out the YouTube video below to learn more about how these cards work and how they helped me become debt free. MONDAY MONEY TIP PODCAST: Is All Debt Bad? Welcome to this week’s edition of the Monday Money Tip Podcast! This week, my co-host, Megan Hibbard and I are discussing debt and if there is a such thing as good debt. We also have some interesting statistics for you from the Motley Fool in regards to the average American and their finances and a success story from a woman who now has a net worth of $1,000,000. Make sure you tune in to get your tip today! Joe shares some interesting statistics from the Motley Fool. Hear a success story about a woman who started using our tactics 8 years ago and now has a net worth of $1,000,000. Joe shares a tool that can be useful for you in your financial journey.